Cysticercosis is a common disease seen in the tropical countries caused by Cysticercus cellulosae, which is the larval form of the pork tapeworm, Taenia solium. It is caused by the consumption of eggs of the tapeworm and spreads by the feco-oral route, where humans act as intermediate hosts, due to poor sanitary conditions and contamination from the tapeworm carriers. Disseminated cysticercosis (DCC) is a rare form of cysticercosis in which the cysticerci spread throughout the body. Patients with symptomatic disease usually have signs and symptoms of neurocysticercosis (NCC), which is a leading cause of secondary epilepsy worldwide. NCC can present as status epilepticus that can induce rhabdomyolysis. Status epilepticus leading to rhabdomyolysis and acute kidney injury (AKI) is a serious complication of NCC which is not reported in the literature. We report a case of a 38-year old man with DCC who suffered from status epilepticus, rhabdomyolysis, and AKI. Informed consent was obtained from the patient and institutional ethics committee for publication. A 38-year-old man was admitted with a history of 6–7 episodes of generalized tonic–clonic (GTC) seizures for the last 3 days. There was history of flickering movements of right side of the face and right hand. There was history of up rolling of eyeballs, frothing from the mouth with tongue bite, urinary incontinence, and post ictal confusion. There was no history of fever, headache, or focal neurological deficit. The patient was known to have GTC seizures for the previous 12 years and was not compliant with the antiepileptic drug (AED) therapy. The patient was a nonsmoker, nonalcoholic, vegetarian, and cook by occupation. He had no history of diabetes, hypertension, tuberculosis, or any other significant illness in the past. On general physical examination, he was drowsy but was cooperative and oriented. He was hemodynamically stable with a pulse rate of 90/min, blood pressure of 120/80 mmHg, and a respiratory rate of 18/min. There was no pallor, cyanosis, clubbing, lymphadenopathy, edema, and the jugular venous pressure was not elevated. On central nervous system examination, meningeal signs were absent, there was no focal neurological deficit and deep tendon reflexes were elicitable. The fundus examination was normal. Chest, cardiovascular, and abdominal examinations were normal. The investigations were as follows: hemoglobin 12.2 g/dL, white blood cell count 12.7 × 103/mm3 with a differential count of 85% neutrophils, 10% lymphocytes, 3% eosinophils, monocytes 2%, platelet count 250 × 103/mm3, erythrocyte sedimentation rate 30 mm first hour, prothrombin time 15.1 s, serum urea 221 mg/dL, creatinine 16.4 mg/dL, sodium 135 mEq/L, potassium 6.7 mEq/L, chloride 108 mEq/L, calcium 6.1 mg/dL, phosphorous 5.8 mg/dL, uric acid 7.4 mg/dL, protein 5.7 g/dL, albumin 3.1 g/dL, bilirubin 0.6 mg/dL, aspartate aminotransferase 485 IU/L, alanine aminotransferase 385 IU/L, alkaline phosphatase 121 U/L, cholesterol 130 mg/dL, random blood sugar 69 mg/dL, serum creatine phosphokinase 55,333 U/L, and lactate dehydrogenase 962 IU/L. Arterial blood gas revealed pH 7.35, paO283.3 mmHg, paCO223.6, HCO312.7 mEq/L, SaO292.2%. Urine examination showed albumin 3+; sugar nil; pus cells 10–12/high power field; granular casts were present; the culture was sterile; and 24 h urine protein was 0.5 g. Viral serology for hepatitis B, hepatitis C, and human immunodeficiency virus were negative. The electrocardiogram was normal. 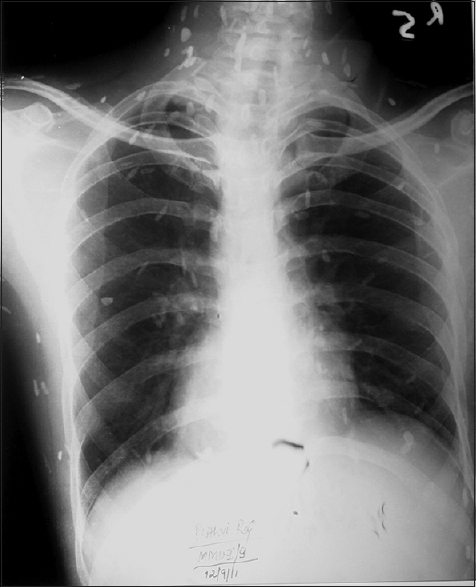 Multiple cysticerci (cigar-shaped calcifications) in the subcutaneous tissues were detected on the chest [Figure 1] and thigh radiographs [Figure 2]. 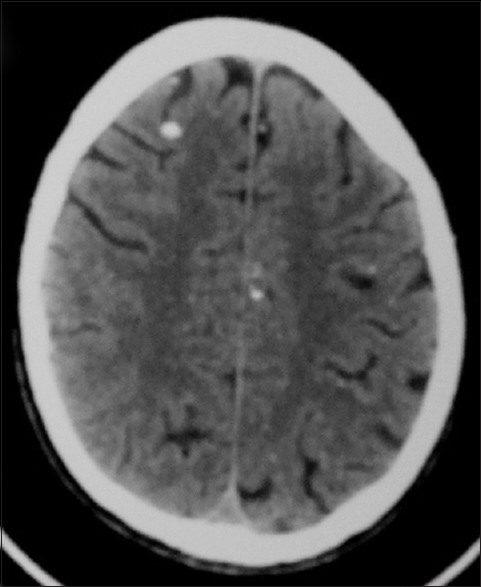 Computed tomography (CT) of the head showed multiple calcified lesions in bilateral cerebral hemispheres scattered diffusely with a few showing peripheral edema, being suggestive of NCC [Figure 3]. Magnetic resonance imaging (MRI) of the whole body showed calcified foci along the muscle planes as well as the entire body, with cystic lesions in brain, left lobe of the liver and peritoneum (with ascites) suggestive of multiple diffuse cysticercosis in various stages involving the entire body. The kidney biopsy showed granular and pigmented granular casts with patchy acute tubular injury associated with patchy severe acute tubulointerstitial nephritis. The patient was diagnosed as having GTC seizures with status epilepticus induced rhabdomyolysis and AKI. He was found to have DCC with involvement of subcutaneous tissues, skeletal muscles, brain, liver, and peritoneum. He was treated with AEDs, steroids for cerebral edema, and other supportive measures. The patient received three sessions of hemodialysis. The course of renal function tests (RFTs) is shown in [Figure 4]. The patient improved and the RFTs had normalized RFTs had normalized at his follow-up visit in 2 weeks time. Human cysticercosis is caused by the dissemination of the embryos of Taenia solium from the intestine via the hepatoportal system to the tissues and organs of the body. The organs most commonly affected are the subcutaneous tissues, skeletal muscles, lungs, brain, eyes, liver, and, occasionally, the heart. NCC is the most common helminthic infection of the nervous system and is a major cause of acquired epilepsy worldwide. It is endemic in Latin America, South East Asia, India, Nepal, China, Africa, and many other developing countries. With increasing globalization and international travel, NCC is now being reported from many developed countries. The CT scan and MRI are useful in the anatomical localization of the cysts; CT being more sensitive than MRI in detecting small calcifications. However, MRI is more sensitive than CT as it identifies scolex and the cyst. Identification of a scolex is the only pathognomonic radiographic finding. Radiographic findings highly suggestive of NCC include cystic lesions, enhancing lesions, and parenchymal brain calcifications., Serological tests for detecting antibodies against cysticercosis are used to confirm the diagnosis. Plain radiography can be useful for evaluation of extraneural cysticercosis such as calcified lesions (“cigar-shaped calcifications”) in muscle or subcutaneous tissue, although a CT scan is more sensitive for assessing these findings. Tonic–clonic seizures are not usually followed by rhabdomyolysis, except in cases of tonic–clonic status epilepticus. Irregular antiepileptic treatment is an important risk factor associated with convulsive status epilepticus. Excessive muscular activity, such as status epilepticus, results in a state in which adenosine triphosphate (ATP) production cannot keep up with the demand, subsequently exhausting cellular energy supplies, leading to a disruption of muscle cell membranes. Rhabdomyolysis is characterized by skeletal muscle necrosis with release of myoglobin and muscle enzymes to plasma, detected by raised values of serum creatine phosphokinase and the presence of myoglobinemia and/or myoglobinuria. The latter is responsible for AKI secondary to acute tubular necrosis. Mechanisms of AKI include intrarenal vasoconstriction and ischemia, direct and indirect ischemic tubular injury as well as obstruction. 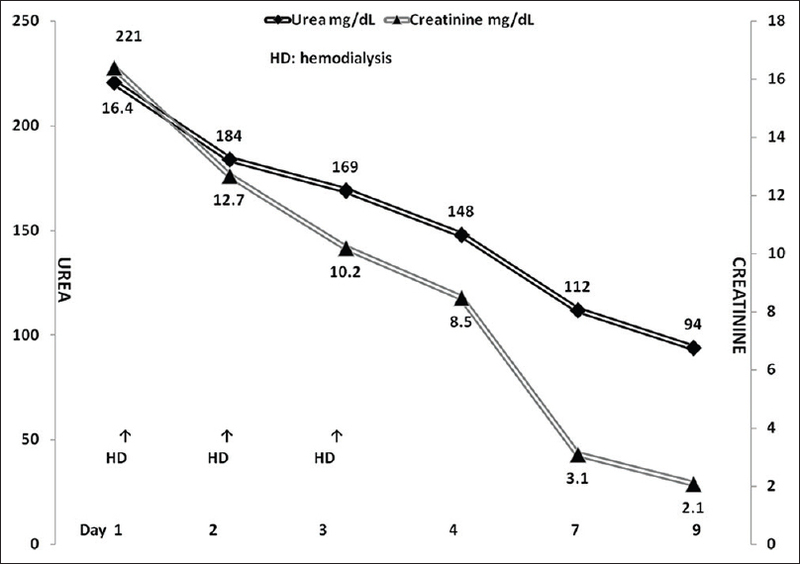 To prevent AKI in patients with rhabdomyolysis, measures such as hydration, alkalinization of urine, and loop diuretics are instituted., Development of severe hyperkalemia, acidosis, and oligo-anuric AKI is the indications for dialysis. In conclusion, DCC is a serious disease with potentially life-threatening complications. DCC presenting as status epilepticus-induced rhabdomyolysis and AKI is not reported in the literature. Our patient is the first reported case of DCC, who after having status epilepticus due to irregular treatment of epilepsy, also developed rhabdomyolysis and AKI. He was treated successfully with AEDs, steroids, hemodialysis, and other supportive therapy. Garcia HH, Nash TE, Del Brutto OH. Clinical symptoms, diagnosis, and treatment of neurocysticercosis. Lancet Neurol 2014;13:1202-15. Singhi P. Neurocysticercosis. Ther Adv Neurol Disord 2011;4:67-81. Bhalla A, Sood A, Sachdeve A, Varma V. Disseminated cysticercosis: A case report and review of the literature. J Med Case Rep 2008;2:137. Sardana V, Ojha P, Sharma D, Sharma SK, Saxena S, Rai NN. Disseminated cysticercosis. Neurol India 2016;64:1058-60. Krishnaswami CS. Case of cysticercus cellulose. Ind Med Gaz 1912;27:43-4. Qavi A, Garg RK, Malhotra HS, Jain A, Kumar N, Malhotra KP, et al. Disseminated cysticercosis: Clinical spectrum, Toll-like receptor-4 gene polymorphisms and role of albendazole: A prospective follow-up of 60 cases with a review of 56 published cases. Medicine (Baltimore) 2016;95:e4882. Garg RK, Uniyal R, Malhotra HS. Be careful while using albendazole/praziquantel in neurocysticercosis. Neurol India 2017;65:924-6. Muthukumar N. Neurocysticercosis: Evolution of our understanding. Neurol India 2017;65:885-7. Bustos JA, Garcia HH, Dorregaray R, Naranjo M, Pretell EJ, Gilman RH, et al. Detection of muscle calcifications by thigh CT scan in neurocysticercosis patients. Trans R Soc Trop Med Hyg 2005;99:775. Singhal, PC, Chugh, KS, Gulati, DR. Myoglobinuria and renal failure after status epilepticus. Neurology 1978;28:200-1. Sánchez S, Rincon F. Status epilepticus: Epidemiology and public health needs. J Clin Med 2016;5:71. Vanholder R, Sever MS. Erek E, Lameire N. Rhabdomyolysis. J Am Soc Nephrol 2000;11:1553-61. Bosch X, Poch E, Grau JM. Rhabdomyolysis and acute kidney injury. N Engl J Med 2009;361:62-72.